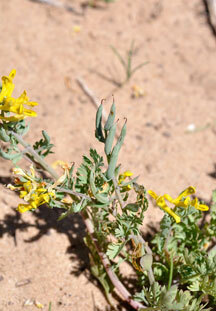 Stems: Several, prostrate to ascending, simple or branched. Leaves: Basal and/or cauline, alternate, usually 2-3-pinnately compound; petioles to 2.4 inches long, (short-petiolate distally); blades oblong to ovate, .8 to 4 inches long, pinnate with 5-13 segments that are pinnatifid; ultimate lobes elliptic, margins incised. Inflorescences: Racemes, terminal, 10-20-flowered; bracts elliptic to linear, .16 to .4 inch long, .04 to .08 inch wide; pedicels .2 to .4 inch. Flowers: Flowers initially erect, later reflexed; sepals 2, ovate, .04 to .12 inch, tapering to points; petals 4, yellow, outer petals dissimilar, 1 spurred, 1 not spurred, both with abaxial median crest, inner petals similar, connate at apices, clawed; spurred petal .5 to .6 inch, spur straight or slightly incurved, .16 to .2 inch, tip nearly spherical; stamens 6. Fruits: Capsules, erect to pendent, long-cylindric, .5 to .8 inch, glabrous; seeds black, reniform to nearly globose, ca. .08 inch, smooth or outer 1/3 reticulate; arillate. Comments: Corydalis, crested lark, alluding to the resemblance between the spur and a lark's hind claw and aurea, golden.